BIOPREPARÁTY, spol. s r.o. 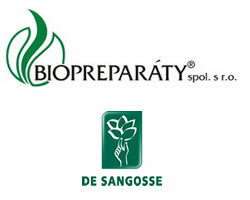 and DE SANGOSSE recently signed a commercial agreement for exclusive development and distribution of Polyversum. The agreement names De Sangosse as exclusive distributor for Polyversum, a bio fungicide which active ingredient is pythium oligandrum M1 to develop, register and market in France, Germany and the UK. "This new bio-control product will be developed on various crops, especially on OSR and also on cereals, potatoes and others large crops for which one number of biocontrol solution is for the time being , very low. The agreement will allow De Sangosse to develop its strategy in the field of Plant Protection by offering the market solutions integrating conventional and bio-control technical programs. " said Christophe Maquin, Marketing Director. "Pythium oligandrum is an Annex I listed active substance and the commercially formulated product Polyversum has been successfully marketed in Central and Eastern Europe in several crops, ie canola, sunflower, wheat, barley, strawberry and veggies since1997. It has shown and confirmed its efficacy under different conditions and crops and BIOPREPARATY is expanding its business opportunity in the EU. We are very happy having DE SANGOSSE as our exclusive partner to face the French, German and UK markets" said Jiri Uher, Business Development Manager.